Every now and then, you realize that you have more hard drives than you know what to do with. Over the past year, I’ve been on a serious cleanup of all the technology I have laying around. Got rid of 4 monitors, 6 laptops went out, a desk, some old computer cases, video cards, RAM, lets face it, it’s not going to provide any future in the value, so why not try and sell it, and if you need it again in the future, you can probably buy it cheaper. Today’s set of consolidation includes my Hard Drives. 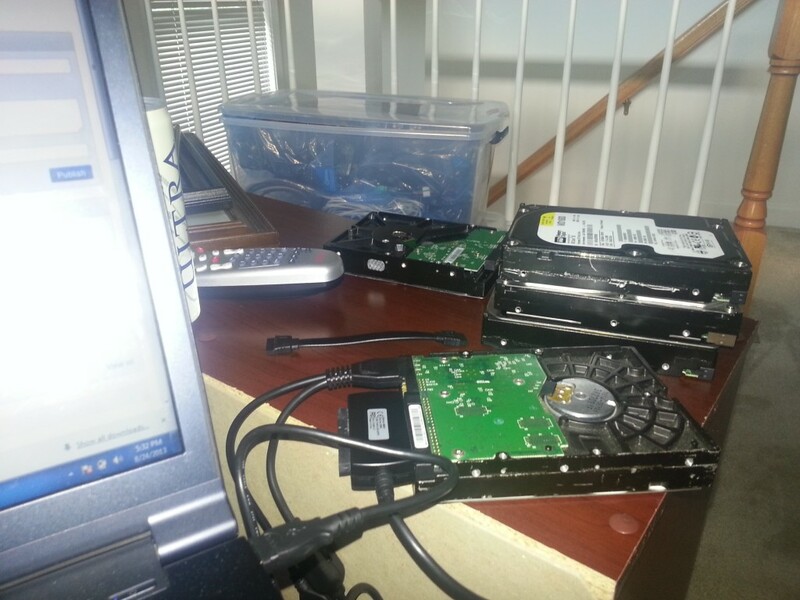 I am a technologist, so it’s obvious that before tossing my drives, I’m going to do a couple of things before hand. First, I’m going to plug it into my working computer with my IDE / SATA adapter and I am going to blow away all the partitions and ZERO-FILL the entire drive. Quick Format’s will not remove the data, you actually have to run through the drive and take care of each bit. Quick format’s typically break references while everything else is kept in-tact. The next thing I’ll do is have a little fun with a drill-bit and a hammer. I’m going to make it certain that you cannot read these disks again. That said, it’s a bit over-kill, so I wonder… why go through all this to protect your data. I mean, this is my personal data. What if I do not properly destroy my data and I let it wander into the junk yards of history? Is it likely that someone will find it 100 years from now and find an ability to read it? Technically, if Hard Drives are kept in proper conditions, they can last greater than 10 years (factory warranties are typically 5 years), but it’s extremely easy to prove several cases of drives lasting longer than 15 / 20 years. That appears to be when most of the degradation takes place on cylindrical hard disks. Solid states though, could last for far greater theoretically, they just haven’t been around long enough to tell. The hard drives I will be working on and throwing out tonight came from the following years, the two others are WD 500 GB SATA and WD 750 GB SATA, which will simply be cleaned off and stored away. Maybe you can just throw your SSD’s out in a nice container and use it as a time capsule? That said, even though the data I have isn’t exactly government secrets or going to ruin my life, my OCD complex, need for completeness, and knowledge of technology and how long these hard drives can last Makes me need to zero fill and drill and hammer the heck out of these drives before disposing. Plus, who doesn’t like to play with a drill, hammer, and hard drives with a couple of beers on a Saturday night? This entry was posted in ***, beer, Electronics, Hardware, Home Projects, Rants. Bookmark the permalink.